I’ve been struggling with the fact that this challenge is just about over. Holding myself accountable every week to meet my health and fitness goals has really allowed me to start 2013 healthy and happy. I will say before this started I ate when I was sad, I ate when I was mad, I ate when I was bored, and I indulged in whatever I wanted. It really took this time to rededicate myself to my health and fitness and to realize I don’t want to use food as a way to cope. My favorite new product has got to be my heart rate monitor from Omron. From running to workouts at the gym it’s helping me stay on track and even push and challenge myself further. I learned a lot about heart rate and where I want my weight to be. I think I actually finally learned the fundamentals which will help me meet my goals on into the future. I started running again and find joy in being active. I stuck with the challenge through the end and proved to myself that I can do it. That this is possible if I work hard! The harder I work the better I feel too and leaving all the desserts and pasta/breads behind have left me not feeling so guilty all the time. I am happier and healthier and I can’t wait to spill it all during the twitter party tomorrow! Want to kick start your fitness goals? Jon myself and the other Omron Ambassadors for a Twitter party!!! Also: March 9th is our Virtual 5K! Have you signed up yet? 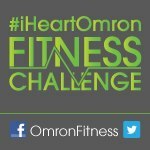 Disclosure: This post is sponsored by Omron Fitness as a collaboration with Bookieboo Blogging Network and Mamavation – a community dedicated to weight loss for women and obesity prevention for families. I was provided with product and compensation for my time and honest opinions. Loving that you are losing weight! Good job girl, you should be proud! what pants are you wearing? I’m just wearing black running leggings. They’re tight and light plus comfortable. I need new running gear!!!! !